In this article we can explore the Event Handling features of List through code. Using the SPList in Server Object Model we can access event handling for a list. 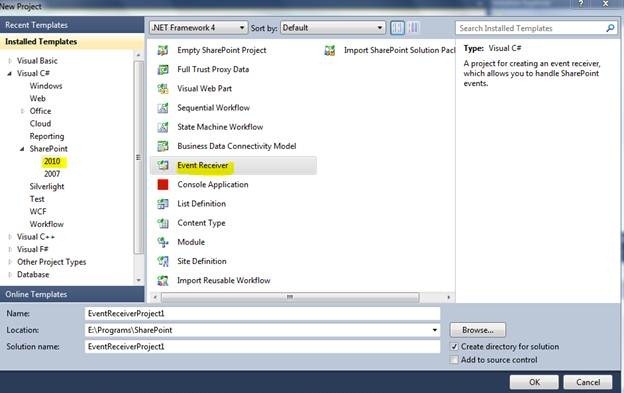 For starting with create an Event Receiver project inside Visual Studio. By default the machine site will be shown in the dialog box. Leave the default option of Sandboxed solution and click the Next button. Select the List Item Events and use event source as Contacts. Check the check boxes for added, updated and deleted events and click the Finish button. Note: The site url can be changed later. For time being we are using hard coded urls. 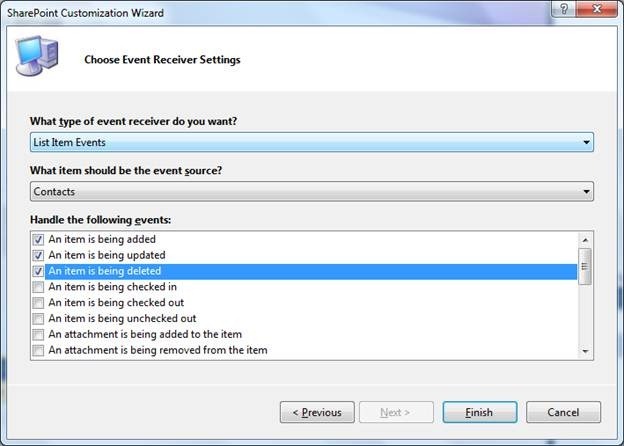 On clicking Finish button, the code will be generated for the List Event Receiver and you can place a break point in the ItemAdding event as shown below. Now execute the application and your Event will be added and activated. On clicking the Save button, the breakpoint inside Visual Studio will get hit:. You can cancel the operation by using the Cancel property. You can report an error message using the ErrorMessage property. You can take a note that while you stop Visual Studio, the item deletion is allowed inside SharePoint. 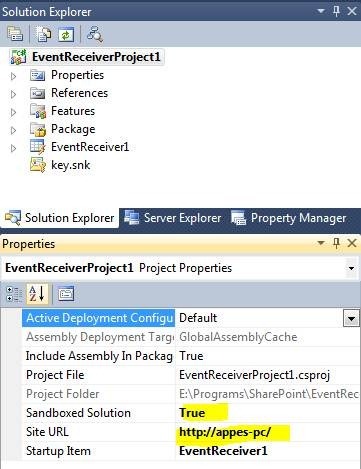 To make the event receiver permanent, use the project Deploy option. Now try Deleting an item without Visual Studio Debugging. You will get the same Error Message Dialog and this concludes the Event Creation and Deployment to a SharePoint site. You can change the Url and other properties created through the Wizard. Use Project > Properties to access/modify these properties. The event receiver is actually deployed as a feature inside SharePoint. You can view the Feature properties and the associated xml file under Features special folder as shown below. The Event code and Elements.xml reside inside the EvntReceiver1 group as shown below. In this article we have explored the List Event facility of SharePoint. 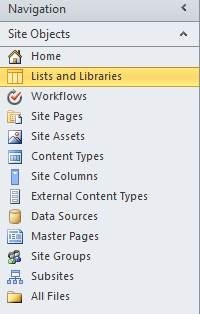 In advanced List Management these flexibilities are great tool for a SharePoint Developer. 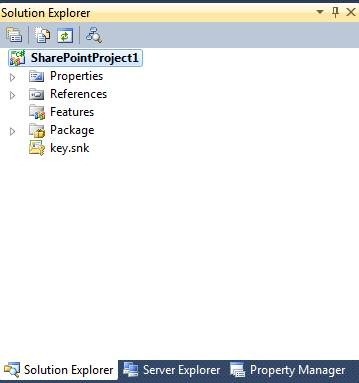 For programming against the SharePoint items, we need to retrieve the properties and the methods to operate on them. The SharePoint Object Model provides various classes to accomplish this. In this article we can discuss the Object Model with the core classes involved with little amount of coding. Here we are discussing only about the Server Object Model. Server Object Model classes are used for server side programming and will be executed on the SharePoint Server Farm. The Server Object Model classes are residing in the Microsoft.SharePoint assembly. The general classes are available inside Microsoft.SharePoint namespace and the administration classes inside Microsoft.SharePoint.Administration namespace. Following are the important classes and their corresponding SharePoint items. Now we can start with experimenting some of the above classes. For starting with we can create a SharePoint Console Application. 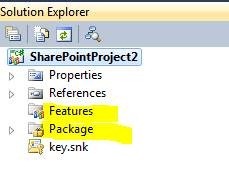 Use the New Project > SharePoint > Console Application project item. 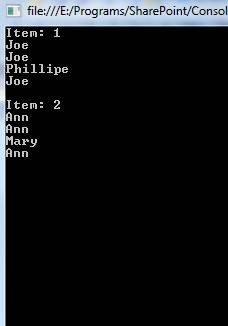 For proceeding with this example create a list derived from the Contacts template and name it as “My Contacts”. Add some items inside it with First Name and Last Name set. Use the following code inside the Console application and execute it. 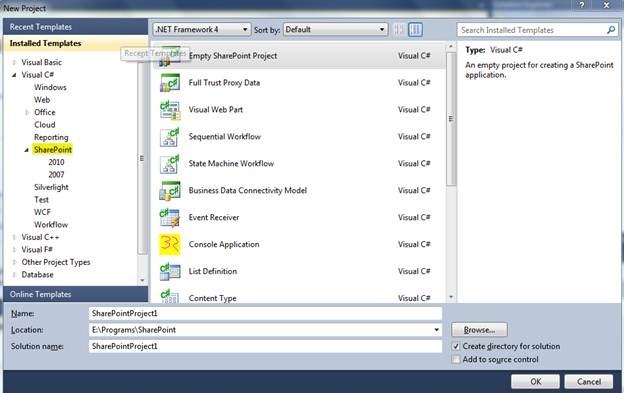 If you receive any build errors regarding namespace, change the Project Properties > Target to .Net Framework 3.5. Now try building the application and it should work fine. You can see the following output. Please note the usage of Title, Name properties and the GetFormattedValue() method. Now we can proceed with accessing the document library items programmatically. For proceeding with you need to create a document library inheriting from Document Library template and name it as “My Docs”. Upload one or two documents into it. We are proceeding to get the file name and length in this example. Enter the following code in the console application. Executing the application you can see the following results. The SPControl class acts as the base class while developing server controls. It reseides in the namespace Microsoft.SharePoint.WebControls. The SPException class can be used to handle exception inside a try catch block. It represents the exceptions thrown by the server object model. The SPUser class can be used to access user information for a SharePoint site. Enter the following code to get the number of users and their names. On running the code you can see the results based on your machine users. You can add a new list item or library item using the Items.Add() method. For updation and deletion use the item.Update() and item.Delete() methods respectively. More code coverage on these areas will be provided later. In this article we have explore the SharePoint Object Model and some basic coding examples with List and Library. The advanced coding examples will be provided at later point of time. In this article we can closely examine the SharePoint Project items and related topics. I believe that the previous article regarding installation of SharePoint Tools for Visual Studio 2010 is completed successfully. This is a template whose contents are common to all other templates. It includes all the references needed for SharePoint development. This template contains the Features and Package files needed for deployment. Sequential Workflow refers to a series of business logic steps performed in sequence. State Machine Wofkflows are not performed in sequence, but carried out by actions and events. 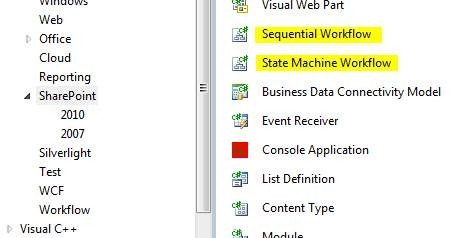 The workflow templates contain the items to create Sequential and State Machine Workflows. We can create site level or global workflows through these templates. This project contains a site definition folder which includes the default aspx page for the site, site component file, site configuration file etc. This project template contains the List templates. It includes content type, list templates, event receivers etc. The module template is used to include the manifest xml file and the notes about a project. It is not the Module concept in Visual Basic. We can create Web Part using the designer inside Visual Studio. This project template contains supports Visual Web Parts. Content Types are information on data. For example a Task can be declared as a Content Type. Later Task can be used inside a List. Apart from the custom properties, we need to explore the other topics related to SharePoint development using Visual Studio. 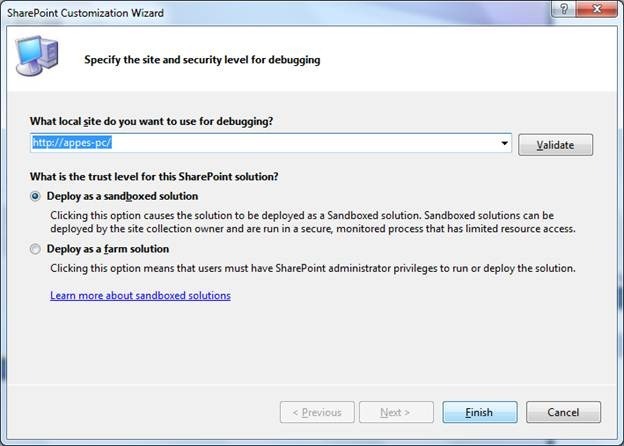 A Sandboxed Solution is a new concept in SharePoint Foundation that allows the users to upload their own code solutions. The Sandboxed Solutions are viewable and validated by Administrators through the Solutions Gallery. 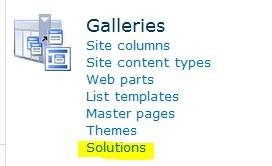 The Solutions Gallery can be accessed from Site Actions > Site Settings > Solutions. We can view the resource usage of solutions and manage the quota from the Solutions Gallery. In this article we have explored the Project Items inside Visual Studio and had an overview of the various aspects of SharePoint development. 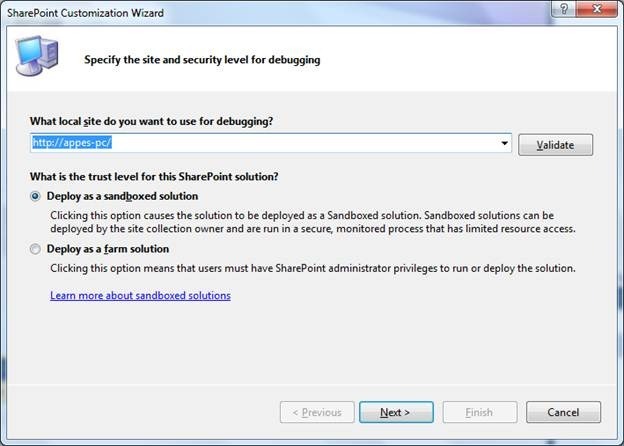 In the upcoming articles we can jump into coding solutions for SharePoint 2010. In this article we can start with programming part of SharePoint 2010. Through programming we are able to get more control and flexibility over SharePoint. We can use Visual Studio to do the programming part with the support of SharePoint server side object model library. 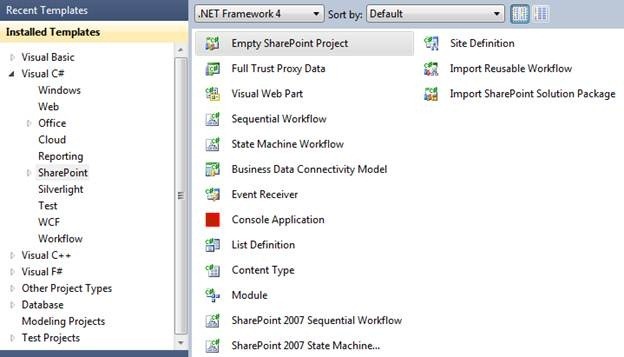 Here we are using Visual Studio 2010 to work with SharePoint 2010. You can use a 32 bit or 64 bit version of Visual Studio 2010. This tool helps with custom templates, automatic web part deployment to SharePoint server and other integration facilities. 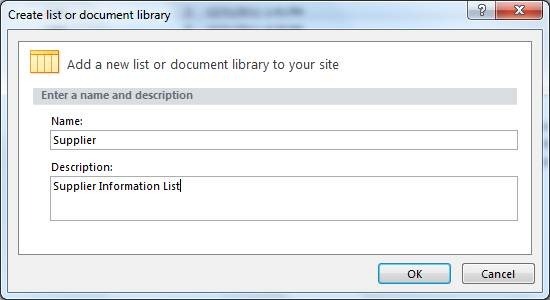 For starting with select the Empty SharePoint Project template and click Ok button. The following site dialog box will be prompted. Enter your site url, leave the other options as unchanged and click Finish button. 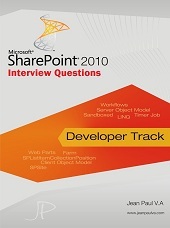 Try building the project and if the build succeeds your Visual Studio is ready for SharePoint 2010 development. We can explore the programming areas in the upcoming articles. In this article we have explored the programming part of SharePoint 2010. Using Visual Studio we can gain control over the SharePoint sites and features. In the upcoming articles we can play around with the object model and features. In this article we can experiment with List Definition creation using SharePoint Designer. To proceed with run the SharePoint Designer application. Use the Open Site button to open the default SharePoint site. Now select the Lists and Libraries option from the left Navigation bar. From the ribbon menu, use the Custom List button. In the appearing dialog box enter the Name and Description for the List. Click the OK button continue. The new List Definition will get added as shown below. Now use the Edit Columns button from the ribbon menu. You can see the default Title column already in the list. Add the following 2 columns using the Add New Column button from the ribbon menu. Click on the Save button from the Top menu. You can try adding a new item and the dialog window shows the columns we added. Click the Save button and this concludes our List Definition creation using SharePoint Designer. 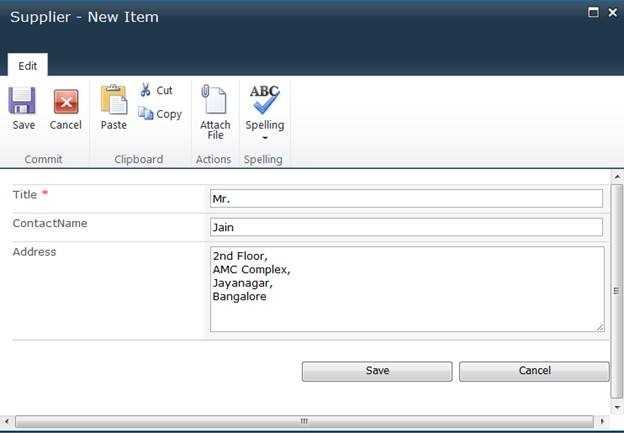 In this article we have experimented with List Definition creation using SharePoint Designer. Designer provides an easier way for Administrators.